These coveralls have an attached hood and boots. A true one piece design. Bunny suits are an "all-in-one" style of coverall by featuring an attached hood and boots. This one piece design provides the most skin and hair coverage to protect your controlled environments. Tyvek®: Tyvek is a unique, nonwoven material comprised of heat and pressure bonded polyethylene filaments. 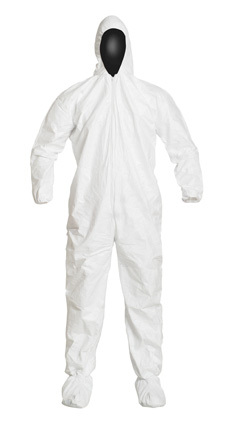 Resistant to penetration, Tyvek is a highly effective contamination control fabric. It is chemically and biologically inert, low linting and static-free until it is laundered. Tyvek® IsoClean®: One of the most popular products in the DuPont Controlled Environments portfolio, is the DuPont™ Tyvek® IsoClean® line. The IsoClean line is clean-processed, single-use garments that offer an ideal balance of protection, durability and comfort. In addition, they feature the lowest linting and particle shedding of any garments in the DuPont portfolio. Please browse a few of our more common bunny suits, materials, and cleanliness levels below. If you can't find what you are looking for, contact us to learn about some of our other available options.